Holidays are, without a doubt, one the best parts of the year. Hardly anyone can disagree with that. And hardly anyone could disagree that, for an athlete, holidays are more than essential. Their bodies are their mean of work; and while part of their jobs is to keep it fit by training and eating healthy (among other things) resting remains one of the keys for a long career. It is not new that players from Pan America have been in disadvantage in this regards compared to their teammates in European clubs, but until now, this issue doesn’t seem to have caught enough attention, or it hasn’t been voiced with the required strength. You may be wondering what’s that disadvantage I’m talking about. Simply put: the adults’ Pan American Championships are usually played at a time when players who play in Europe are either at the end of the season or already looking forward to putting their feet on the sand (if they’re the beachgoers type, of course). So yes, athletes from Pan America have been relegating their holidays to meet the commitments with their national teams. But they’re getting tired of it. These situations could lead to troublesome relationships between the national teams and the clubs. Players have to attend trainings with their national squads and sacrifice resting time that is crucial for their bodies towards the beginning of a new season. It wouldn’t be absurd if a club prevented their players to be present in these tournaments, considering that they are their employers. It has happened in the past, and it’s certainly not the best scenario for the continental prospect. That being said, it is clear that the Pan American calendar of competitions is something that could be improved in order for the players to have the same amount of holidays as their colleagues from Europe. The last men’s Pan American championship was played in June of 2016. Holidays are too short for the Pan American players. 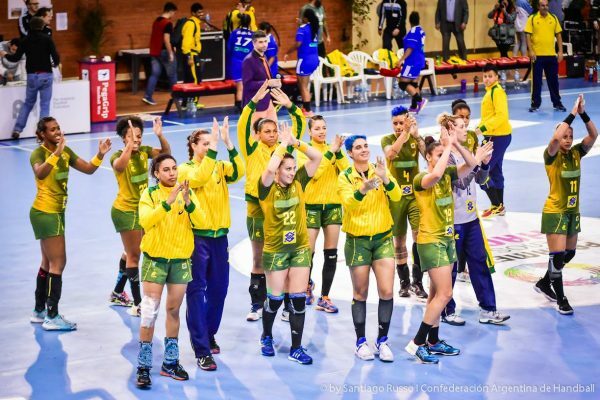 The most recent Pan American tournament was the women’s edition, held in Argentina last June. By the time the event had started, nearly 20 of the participating athletes were devoting their precious resting time to competing in a tournament that serves a qualifier for a World Championship. It was during that week in Buenos Aires that America’s currently most decorated player in Europe, Brazilian Eduarda Amorim, met with Mario Moccia, president of the PHF (Panamerican Handball Federation) to express the concern of a large group of players, not only from Brazil, but from the rest of Pan America as well; the concern that the calendar did not match the athletes’ resting periods and did not fall into an IHF week. She left Buenos Aires with the impression that the subject would be taken into consideration and treated in the upcoming PHF sessions. Amorim was not exaggerating when she said she talked on behalf of a large group of players. But I decided to make a poll to find out the extent of this concern. 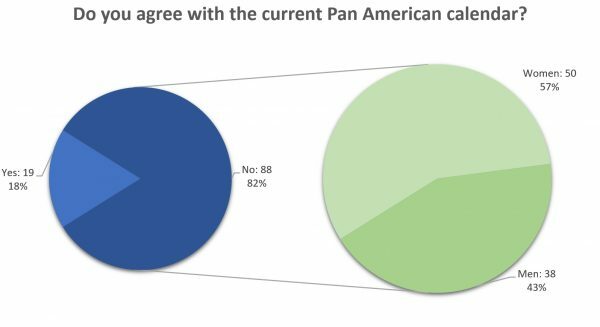 A total of 107 players answered a brief and anonimous questionaire that inquired them about the Pan American calendar and suggested dates. An impressive 88 out of 107 athletes from Argentina, Brazil, Chile, Paraguay, Puerto Rico and Uruguay (both men and women), answered that they would like the Pan American dates of the continental tournament to be revised and modified by the PHF. Of those 107 athletes, a total of 52 currently play in Europe. This means that this is not a concern that reaches only those who have a professional career in handball and a much tighter match schedule, but also those who are still playing in their own countries. But that was only one side of the story, so I went on to look for the word from the PHF. The official answer was the same as the one received by Győri AUDI ETO KC’s left back: the subject would be looked into, sooner or later, by the PHF board. I would later find out that I was not the only one asking for an insight from the Pan American Federation. 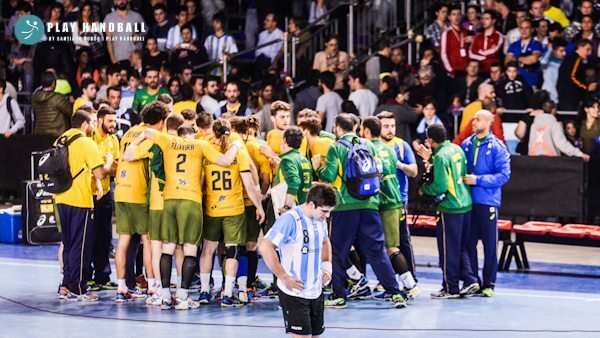 The EHPU (European Handball Players Union), through its president, Michael Sahl Hansen (director of the Danish handball players union, Håndbold Spiller Foreningen), had already sent two letters to the PHF, asking for a meeting to talk about the concern from a group of South American players working in Europe. The letters, sent on April 19th and June 20th, are still unanswered. On the radio show from Argentina, Handball de Primera, Hansen explained how the EHPU found out about this matter: “We’ve been in contact with the players, specially in France and Spain, where most of them play, and the unions from those countries have also been in touch with them. So this is not something that we as EHPU came up with, but rather something we found out through our direct contact with the players from Argentina, Brazil and Chile, for example”. “Sadly we have not received any letters or feedback from the president of the PHF. Our letter was to request a meeting with him because our concerns are the players’ health and safety. 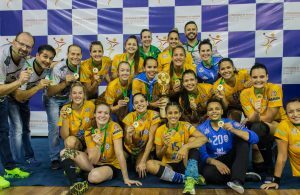 The best players from the South American countries play in Europe, and here we’re used to having holidays in the Summer time, and that’s when the Pan American Championships are scheduled”, continued Hansen. His suggestion, as that of most of the protagonists, is that the tournaments could be moved to January and December, when the men’s and women’s European championships respectively are played. This would mean that everyone would have holidays at the same and no sacrifices would have to be made in order top play for the national teams in the most important continental tournament. A total of 107 players from 5 countries answered the poll. 88 of them are requesting a change. The last question of the poll inquired athletes about the injuries: Do you think that a change in the Panamerican calendar would help prevent injuries caused by excess of work load or lack of rest? An overwhelming 95% of the answers were for the ‘Yes’. This might be the most important matter with this regards. It’s not a mere whim, but a need. The fact is that the players are requesting the PHF to take action. And the truth is that, for the sake of Pan American handball, this should be discussed as soon as possible before the athletes, who are the main actors, start missing the tournaments. It is great to see South American players succeeding in Europe, it means that the sport is slowly growing, and these players are our most important asset. The next Pan American commitment will be the men’s tournament, which will be hosted by Greenland and will be the qualification stage for Germany-Denmark 2019 and will certainly not take place on January of 2018, time’s ticking and there’s no way to advance the dates (which have not be fixed yet) on such short notice. But there’s still plenty of time to analize this imperative issue make the necessary arrangements to have the next women’s tournament while France hosts the EHF Euro on December of next year. On a personal note, I wouldn’t like to see the next Pan American Championships without our greatest stars, or even worse, I wouldn’t like to see our greatest stars sidelined due to injury caused by excessive work load. The issue is raised, now it’s time to act. ← Previous Story VOX POPULI: Dragon ball effect or Invincibles from Balaton?